The historic Coffee Cup restaurant has a new home after opening in NoDa about a month ago. It's located in the Highland Mill complex in the building that houses two bar/nightclubs, Prevue and Alive. It's actually on the corner in between the two clubs and I never even realized there was space for something to go there because there previously weren't any windows in that spot. Now windows have been cut out, the inside has been remodeled, and it creates a nice diner atmosphere for the Coffee Cup. I met a friend there for lunch yesterday. If you don't know the Coffee Cup's history, the soul food restaurant originally opened on South Clarkson Street on the outskirts of uptown in 1947. It's credited as the first Charlotte restaurant to integrate. It was a staple on the local restaurant scene for decades, but in 2006 Beazer Homes, which had bought the property the year before, announced plans to force the Coffee Cup's owner to leave so they could tear down the building to build condos. This was when Charlotte's real estate market was developing at a break-neck pace and developers were trying to build on every piece of attractive property in and around uptown. After a yearlong battle to save the Coffee Cup, including efforts by the Historic Landmarks Commission and a petition from thousands of Charlotteans, owner Gardine Wilson decided to leave and in November 2007 he opened a new Coffee Cup in University City. That location never garnered the following of the old place and closed a year later. At the time, Wilson said he was working on restructuring plans for the restaurant. Then a couple of months later he said it would be closed for good. But all of a sudden the new place opened in NoDa in late March. I believe this will be Wilson's last attempt to make it work. And I think it can work, even though this economy means it's not such a good time for a restaurant to open. The new Coffee Cup is in a good location. NoDa has a good scene of niche restaurants, bars, shops, and galleries and the Coffee Cup should blend in very well. It has plenty of parking right out front, which is always a plus in my book and is especially important for drawing lunch crowds who are dashing in from work. Inside has a classic diner feel. And most importantly, the food is great. 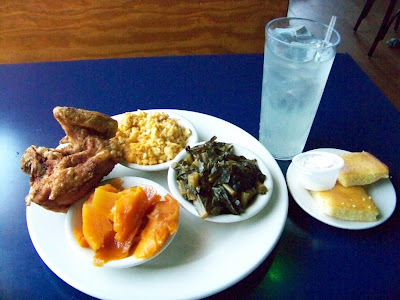 I had the fried chicken, which comes with two sides and cornbread (or biscuits) so I got the mac-n-cheese and collard greens and I also ordered an extra side of sweet potatoes. The meal arrived less than ten minutes after I ordered it, perfectly seasoned, and piping hot. My drink was lemonade and it's probably the best lemonade I've ever had. The service was good, too. Our waitress was Wonderful Wanda, who told jokes every time she came to check on us. I hope this location thrives because there are not many other places in Charlotte serving up soul food this good. All it needs is for many of the original patrons to return and for the city's newcomers to try it out. 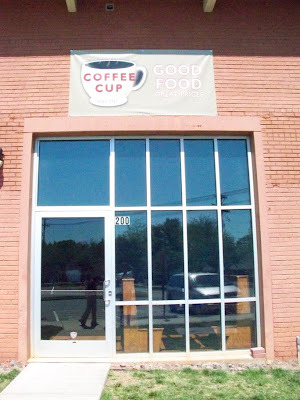 The new Coffee Cup is located at 2909 N. Davidson St. Visit www.coffeecupsoul.com for more details.